In the spring of 1880 a group of citizens began a subscription stock program to lay street car rails for horse drawn cars from Main St down 5th St to the Fairgrounds at Miller Park. This work was completed on October 19th, 1880. The horse lines would run for another 11 years till electric street cars rendered them obsolete. In 1890 several land speculation companies began planning to build electric street car lines in Lynchburg, but by mid 1891 they had all been consolidated or closed until only the Lynchburg Electric Railway company was left. The company operated streetcars until 1898 when it was sold again and became Lynchburg Electric & Light Co. In 1901 the system was consolidated with the general gas and power companies in Lynchburg and Rivermont and the new company was renamed Greater Lynchburg Traction & Light Co. Electric streetcars continued to operate in Lynchburg until November 1st, 1941. After the switch to buses, partially due to the nature of changing service in the Lynchburg area, and partly to the pending war, the company changed its name to the Lynchburg Transit Company. 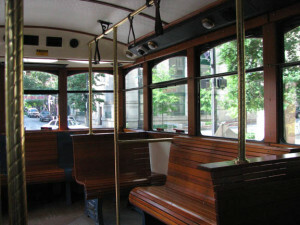 After the elimination of the street cars, Lynchburg Transit operated a variety of buses in the city for the next 33 years. However, by the 1970’s, the private public transit model of business was no longer economically feasible due to suburbanization, the rise of automobile ownership, and the elimination of discriminatory housing and zoning laws which barred minority groups from areas of the city. In October of 1974 the City of Lynchburg bought out the privately owned Lynchburg Transit Co and reorganized and renamed the company the Greater Lynchburg Transit Company (GLTC). The company provided bus service to Lynchburg and in March of 1991 the City of Lynchburg terminated its taxi service contract for the ambulatory elderly and disabled, and GLTC began to operate its Paratransit service for customers with disabilities, based on the Americans with Disabilities Act. Due to state law regarding union negotiations, GLTC, along with many other transit systems, contract out to a private company the management of the transit system. First Transit Inc has been managing GLTC since its inception. In 2009 GLTC celebrated its 35 year anniversary and was also the recipient of the American Public Transit Association (APTA) Small Urban System of the Year award. GLTC is currently working on several large projects to improve our system for our customers including Real Time bus location technologies and a new transfer center with enclosed passenger waiting and ticketing. Currently GLTC operates 37 buses on 14 routes Monday through Saturday and 12 cut-away buses for Paratransit Demand Response. Currently 68% of our Fixed Route fleet is diesel-electric hybrid and the average fleet age of 3.6 years. In 2014, GLTC celebrates its 40th GLTC opened its new transfer center located at 800 Kemper Street. The new transfer center replaced the existing transfer location at the Plaza Shopping Center next to Memorial Avenue. The new transfer center located at 800 Kemper Street is adjacent to Kemper Street Station where Amtrak and Greyhound services are housed. The new transfer station provides easy access to all patrons from rail to pedestrians and even bicyclist from the Kemper Station Trail. In addition to the transfer center and platform, additional parking has been added for the use by all public transit providers. The new station provides conditioned indoor waiting as well as outdoor waiting for all GLTC bus routes and connections. The new station includes customer service, automated ticketing, vending and kiosks maps for easy route location. In addition to passenger amenities, a second floor training and conference room is available for GLTC public meetings, training and special programs for passengers and the community. GLTC drivers have a break room within the facility allowing them to enjoy their breaks and lunches within the facility. The architecture of the facility compliments the City and surrounding area in an industrial style brick warehouse manner. The passengers will enjoy large clear window views to the transit platform and in comfortable weather, two roll up doors can be opened to create and outdoor space inside. The facility is designed to LEED silver standards and will feature a vegetative roof to help cool parts of the first floor, plus Photovoltaic (solar) panels that will generate electricity used by the facility.